The capturing process of a slid may seem alien to people for the first couple times; however, as you practice taking them, they will grow ever better and more interesting. Turn on capture mode and at the top of the screen choose the type of the slid that you would like to create (printable/digital). Think up what you would like to capture, and which object will be central to your plot. You will then move your camera around it. 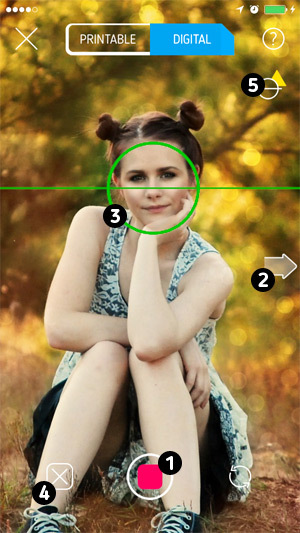 The object or a part of it must fit into the circle which is located in the center of the screen. Hold the device in your hands in such a way that the white lines and circle are united and green. You can move the circle around the screen using your finger in order to place the object somewhere off-center if you wish. The scene you are going to capture should be well illuminated and static (without any motion). Press on and let go of the button in order to begin capturing1. Smoothly move the device in a single motion around the object in the direction that the arising arrow indicates2. Continue to keep the object being captured in the circle and the circle and lines green3. Even if you fail to keep the lines green or moved the circle off of the object – continue to move it non-stop until the circle is filled with color. The app will automatically move to the next screen when capturing is complete. In the case that you want to terminate capturing – just wave the device up or down or click on the reset button4. In the case that an error should arise during capturing, try again or consult the “issues” section if the errors repeat. During the capturing process, warning signs5 may appear in the corner of the screen. You can read about them in the “capturing angle” section.